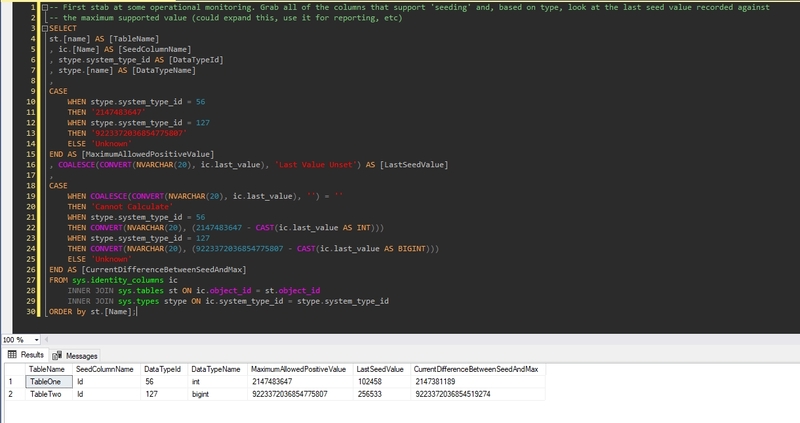 I recently came across a scenario whereby we wanted to programmatically, via T-SQL, inspect locking behaviour on objects in a particular database when operations were being performed on given data (actually just a SELECT (WITH (NOLOCK) and DELETE statement, on a table). The requirement was to get a direct view on whether the table was having an exclusive lock thrust upon it, or whether shared access was still in play (and get an insight into whether we were in the realms of row-level locking or not). In the comments above the code snippet, I’ve included a couple of links to detail the various lock types (information that can be shown in the request_mode view column) that you may encounter. Just run the query whilst a transaction that you want to inspect (for locking activity) is in progress, and voila, you’ll get an idea as to how the resources are being accessed and what impact this is having locking wise. LockTest Table Lock State during Insert. LockTest Table Lock State during SELECT (WITH (NOLOCK)). LockTest Table Lock State during Deletion. 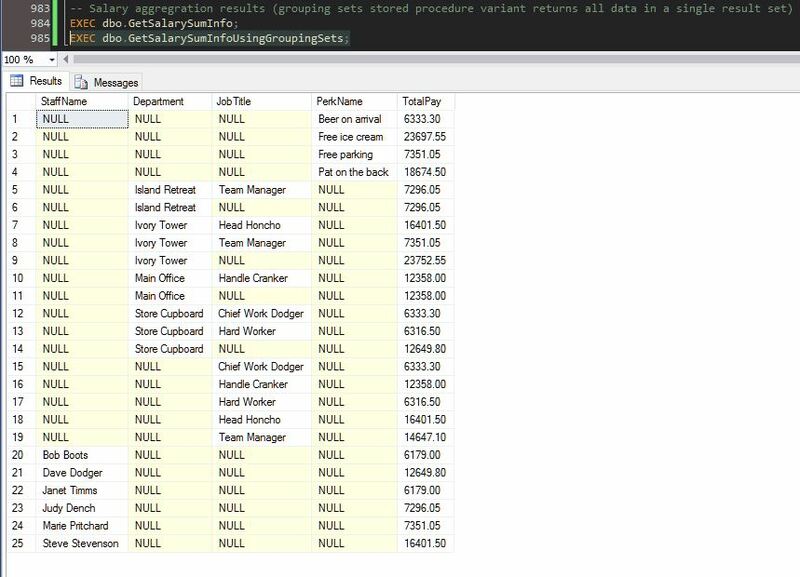 This gives you an insight into how straightforward it is to get an impression on how your SQL objects are being influenced, locking wise, by your code. If anyone has any suggestions on further reading, more useful snippets, etc. then please add a comment below. Thanks, all. In the interim, whilst I juggle my time to get more in-depth posts rolled out (like the one surrounding Alexa skills), I back-tracked once again to look at overlooked features from the distant past of SQL 2008. I’ve chosen the topic of GROUPING SETS as the basis of this post; which basically boils down to a really nice way to return multiple levels of aggregation in a single result set. 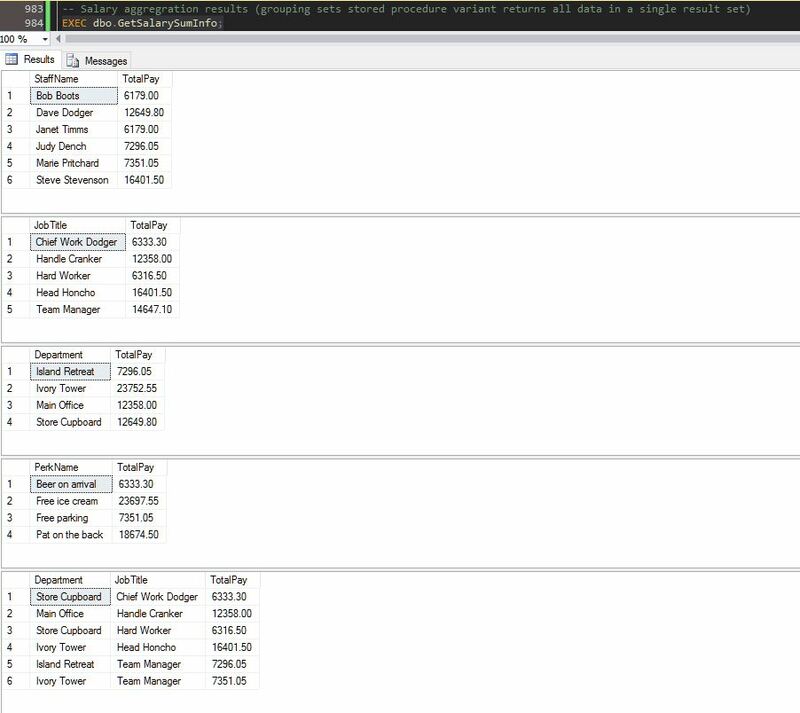 A quick run through then – the following example illustrates a sample database with four tables; Staff, Perk, HolidayRequest and SalaryPayment. The HolidayRequest table has a computed column (based on ‘DateFrom’ and ‘DateTo’) that specifies how many days holiday have been requested (per request) and the SalaryPayment table has an ‘Amount’ column (salary per month). These represent our key aggregation fields. I haven’t actually referenced all columns in the samples provided; I just wanted to give the examples a little bit of extra padding (so they feel more complete). Holiday Request Grouping Set Queries. Feels to me like something that deserves further investigation. Here is the complete listing, if you wish to create the tables with the sample data referenced in this post (procedures, and all, bundled in). Thanks for tuning in! 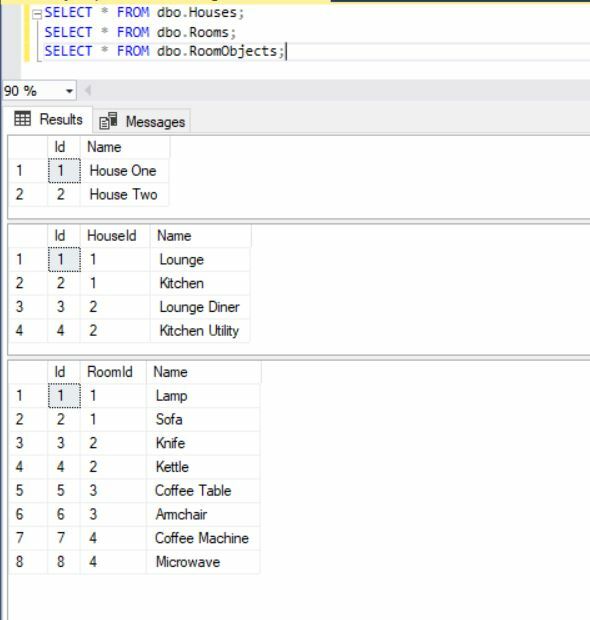 1) This example uses four mock database tables (created internally by the script, no work required :op). Run this on a test database of your choice. 2) Utility, mock data is also inserted by this script (table drop statements, if required, can be found just below this header). 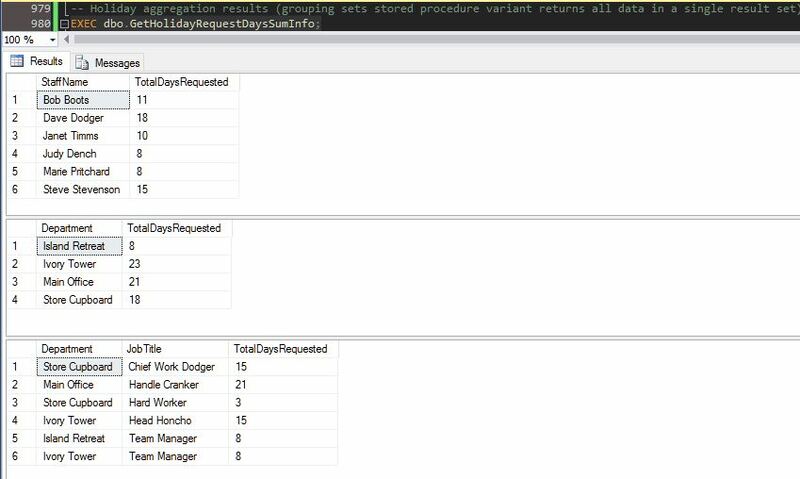 3) The sample data is then aggregated using GROUP BY via two traditionally structured stored procedures (GetHolidayRequestDaysSumInfo and GetSalarySumInfo). Data is returned (for each grouping) using a separate result set. 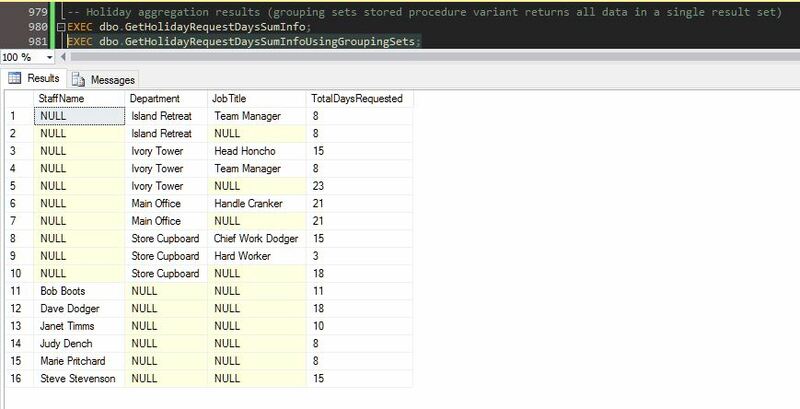 4) Stored procedure variants are then presented that using GROUPING SETS - All GROUP BY variations are returned in a single result set (for illustration purposes only, not saying my grouping selections are actually that helpful in the real world!). Umm…how an earth did I miss this language feature? Where have I been since the release of SQL Server 2008? This really did just pass me by. I’m in the position whereby I don’t often run into this situation; where a T-SQL MERGE statement is directly applicable (i.e. table synchronisation), but still, I was a little embarrassed. Perhaps I have seen this at some point and it’s just been pushed out of my noodle at the expense of some other piece of information. So, red-faced (at least I am), let’s jump right in. In simple terms, this provides a compound way to perform an INSERT, UPDATE or DELETE on a target table, based on a source table. It’s as easy as that; we’ve negated the need for existence checks and other wrapping code/constructs, including the multiple INSERT, UPDATE and DELETE clauses of course. Performance is mentioned on the appropriate MSDN page. However, in my limited testing, I have not yet seen any major issues; just keep this thought on your mental radar anyway. 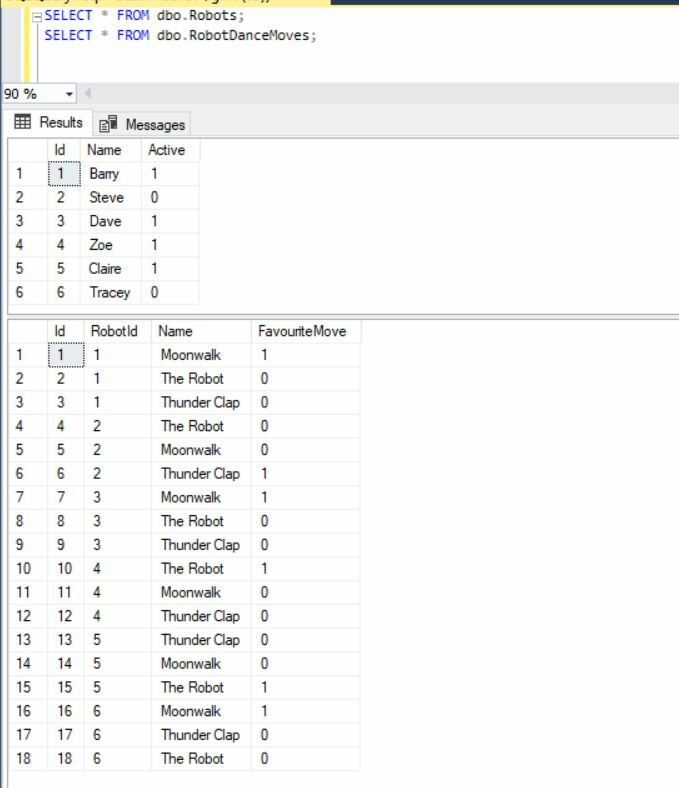 The following script rigs up some test data, in two example ‘target’ and ‘source’ tables, in an effort to demonstrate the synchronisations capabilities of the MERGE statement (apologies for the colour coding issues, I am using the correct language type but it seems to be taking exception to some of the content!). Target and Source Tables Post Merge. Target and Source Tables Prior to Merging. If this was useful to you then that’s superb…my guess is that a fair few of you will be shaking your heads wondering which hole in the sand I’ve had my head planted in for the last few years. Well, I call it how I see it and I’m pretty sure I missed the memo, so for you others out there that may have missed this, enjoy! I’m still playing around with a F#/FitBit related piece at the moment, and I really want it to be a good quality post, so hang on in there as it’s coming soon.